I’d like to explain a common misunderstanding about karma and the Law of Attraction. Some people think that their future is already decided for them. They believe they have no control over anything that happens in their lives because their past actions determine whether good or bad things will happen. They can’t manifest what they want because they have no control over their destiny. I’ve seen some people take karma to such an extreme that they believe that turning down a date means karma will never allow them to find happiness in love. Are these popular ideas about karma accurate? 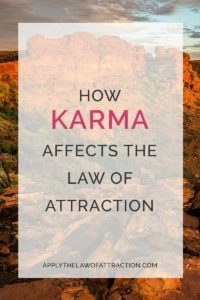 How do karma and the Law of Attraction relate? Karma is Ancient Sanskrit for “action.” It is based on the idea that anything that happens in your life is based on your actions. You can think of it as cause and effect where even something you did in a past life can have negative consequences for you today. Some people use karma to explain why anything bad happens in their life. Essentially, they use karma to develop a victim mentality where karma becomes a scapegoat responsible for all misfortunes. Instead of taking responsibility for their lives, they point to karma. Is Your Destiny Governed by Karma? You shouldn’t view your life as being governed by karma. Anything that manifests is not a result of something you’ve done wrong in the past, either this lifetime or a previous one. The Universe doesn’t judge your actions as right or wrong. It merely looks at what you want or don’t want. It does this by looking at what your vibration matches, and you always know what you’re vibration is by checking in with your feelings. Your actions are never judged by the Universe. Any labelling of your actions as right or wrong is arbitrary. It’s something we, as people, have created and is based on society, culture, etc. It’s a man-made construct. Your past actions don’t influence what you will manifest in your life, unless you decide that they do. What you create with the Law of Attraction is not a result of what you did yesterday, 3 years ago, or 5 lifetimes ago. What you create is a result of what you are vibrating RIGHT NOW. However, your vibration can be affected by your beliefs. Many of your beliefs originated in the past. It is through these old beliefs that your past can govern your present. If you have a belief you’ve had for a while, you may have given it a lot of attention, and thus a lot of power. This makes it easier to think thoughts that match this belief. The belief is still active in your vibration and is affecting your NOW. You aren’t manifesting bad experiences because of past actions. You are manifesting them because the belief is still active! the feelings of guilt and upset are affecting your vibration, not because you incurred bad karma. So Does Karma Even Exist? Karma is based on the idea that if something bad happens to you, it’s because you did something bad and are now being punished. As I’ve already explained, the Universe doesn’t work that way. The Universe wants the best for you. It doesn’t want to hurt you. The Universe doesn’t judge you as good or bad. It doesn’t punish you for your actions. The idea of retribution is made by humans. It is not made by the Universe. The very concept that you'll be punished for bad behavior is based in fear – the fear that you can be hurt for not acting in an appropriate way. But any idea of appropriate behavior is a human construct. The Universe isn’t set up to punish you for your actions. People might punish you, but the Universe isn’t the one that will punish you. The Universe won’t block you from love, money, good health, a happy family, or anything else. The Universe simply wants you to feel good, and it will do what it can to help you feel better and better. I know that we live in a world where we can be punished if we don’t pay our bills. We are punished for answering a question wrong on an exam. We are punished for disobeying our parents. Any time we don’t follow the rules created by other humans, we can be punished – by other humans. But it is never the Universe that is punishing you because of a past action. The Universe will not keep you from manifesting what you want to teach you a lesson. That isn’t how the Universe works. Karma doesn’t affect the Law of Attraction…or your life. Help! I Manifested It and Now It’s Gone! I would like to point that Karma is not what the popular beliefs say it is. Karma is not ONLY a negative consequence coming out of a negative cause, but anything good that happens to you would be because you DID something good in the past. That is the perfect definition of Karma. You do good now, you get good later. You do bad now, you get bad later. If you look at the last two sentences carefully, you will notice that perceiving something to be good or bad is completely up to you. So what you feel is completely up to you. Moreover, I completely agree that the emphasis on the NOW is important. Thus, for people who believe in Karma or the Law of Attraction, choose one and only one. Do not try to mix them both. Believe in one and work ONLY on that one. I agree with you that it is believed that karma can be good or bad. I focused only on the negative because that’s what people are primarily concerned about when it comes to the Law of Attraction. However, karma is still a man-made concept. The very concept of good and bad is man-made, and like you said, you can choose whether you perceive something as good or bad. But perceiving something as good or bad does not mean karma is real. The Universe does not judge anything as good or bad. It does not judge you. The Universe does not grant you good later for doing good now nor does it grant you bad later for doing bad now. It does not work that way – ever. Karma has no effect on the Law of Attraction because karma does not exist. I need help I want to find love, Im ready to be in a relationship! I purchased uour book! Rather to be with a specific person I want the universe to choose for me please help me! I already read your whole books! Calm down! You’re way too desperate and needy. You’ll scare anyone off like that. Learn to let go. Follow the same steps as in Manifesting Love. They will work for a non-specific person too. Hello, I was just wondering, I do believe in karma for the main fact how can children be born in some countries where they live for a few years, stave and the pass away? shouldn’t everyone be born be with the same or similar conditions according to the law of attraction, please could you explain this to me? Thank you! The full answer to your question would require another article. There isn’t space to answer it completely here. However, part of it involves a misconception people have that the Law of Attraction doesn’t begin until you reach a certain age. The Law of Attraction doesn’t wait until you’re old enough to speak or to walk to begin having an effect on your life. It is always working. You never know what someone else might be thinking, wanting, or vibrating at, and that has nothing to do with karma. I’ll have to explain the rest later in another article. I have a question I’ve never seen asked before. What if, based on the loa, 2 people are trying to manifest the exact same thing or person? Both want it equally, both manifest, let it go, believe, visualize etc. both are a vibrational match. Who gets it? I’ve never seen this addressed before.